The bash shell has a powerful parameter expansion syntax, but it’s complex and hard to remember. I always forget which syntax does what, even though I use it all the time for scripts and one-off jobs. 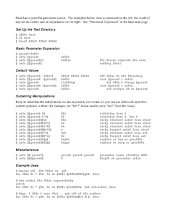 Unfortunately, I find the man page unhelpful as a reference, so I’ve made a cheat sheet for myself. Perhaps you’ll find it useful too. The word is expanded to produce a pattern just as in pathname expansion. If the pattern matches a trailing portion of the expanded value of parameter, then the result of the expansion is the expanded value of parameter with the shortest matching pattern (the “%” case) or the longest matching pattern (the “%%” case) deleted. If parameter is @ or *, the pattern removal operation is applied to each positional parameter in turn, and the expansion is the resultant list. If parameter is an array variable subscripted with @ or *, the pattern removal operation is applied to each member of the array in turn, and the expansion is the resultant list.